As we all know by now, winter planning leads to spring building. Do you have an outdoor project already in the works for this coming season; perhaps your spring plans include the installation of your very own swimming pool? If so, the long wait is over and as soon as the snow melts away, you will be on your way to summer enjoyment. 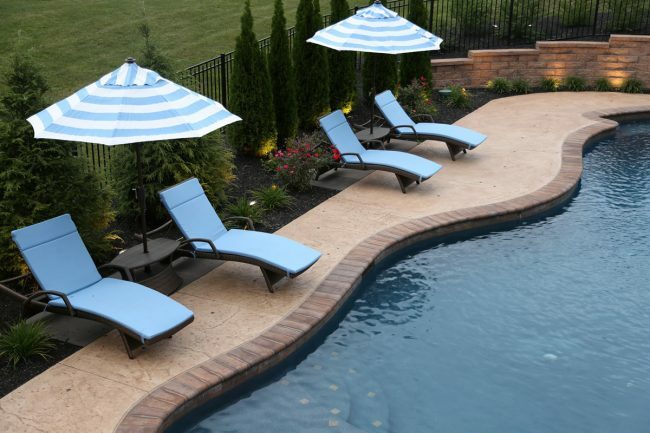 While not many pool companies install more than the pool and coping, you will need to consider a plan and what materials you would like to continue your outdoor living project so your backyard doesn’t look and feel incomplete. Starting closest to the new swimming pool, first you must consider the pool hardscape. Out of the three options we are about to discuss, stamped concrete is the most economical. This material offers many options in design, color and texture, which is one reason you should consult your landscape designer for the most cohesive selection for your home and property. Closely mimicking slate, pavers, flagstone and more, you will find that this low maintenance choice will easily enhance your water feature while providing much needed poolside heat reflectivity. 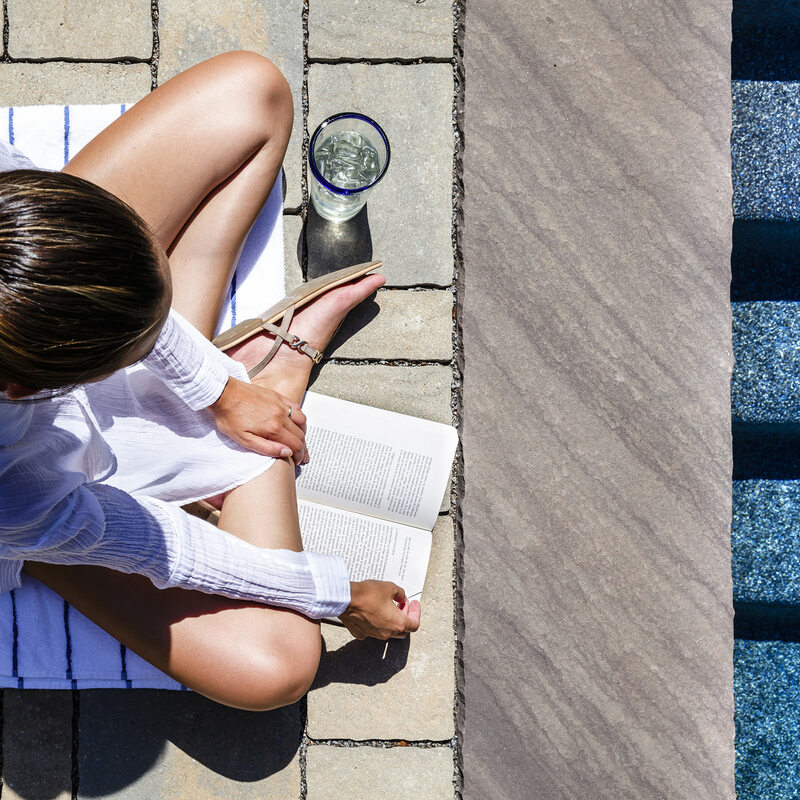 To ensure that the concrete is protected from pool chemicals, wear and from being slick, a sealer with an anti-skid agent should be applied before use and then every 2-3 years as maintenance. The one drawback of stamped concrete is that, yes, it is concrete and, yes, it will crack. While the installer will cut control joints into the patio to guide the cracks to happen where they want it to, this may not prevent cracks from happening elsewhere. If you are looking for a pool hardscape that guarantees no cracks, you can explore other options. 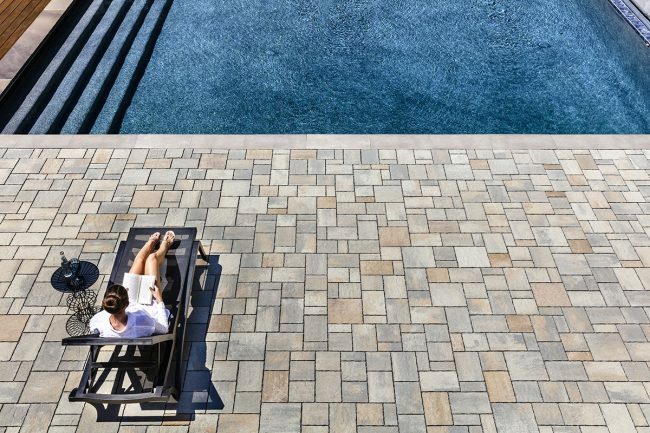 Though more of an investment than stamped concrete, pavers are a great poolside material that will add beauty and durability to your backyard hardscape. An advantage of concrete pavers is that they are engineered for long life and come in an almost endless array of sizes, patterns, colors and textures to compliment your space. 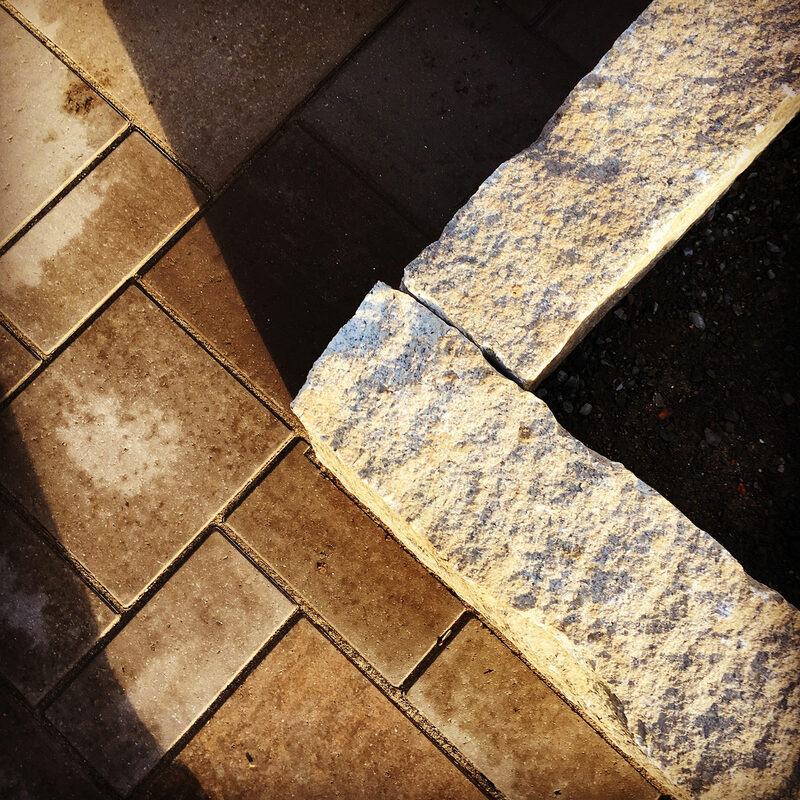 High quality pavers have their color deeply imbedded, so if a chip were to happen you would not see exposed aggregate as you would with stamped concrete. This also means that over time you will not have to worry about wear or color fade, and unlike stamped concrete, patio pavers should not crack if installed properly. Because concrete pavers are not a monolithic structure and have a different installation process, they can endure our freeze/thaw cycles and seasonal weather changes without major issue. As for paver installation around the swimming pool, there are several benefits to guide your decision. Pavers are cool on the feet, have a track record of slip resistance and provide ample traction when wet; this is very soothing to families with young children or older family members. Being low maintenance, very dense and nonporous, there is a high resistance to the growth of algae and mildew, which is a huge plus in an almost always wet environment! Lastly, pavers offer spot correction. If a paver happens to get damaged or a pool repair needs to be made, individual pavers can be removed and replaced once the underground issue has been resolved. The ability to spot correct saves time and money over continuous hardscaped surfaces. 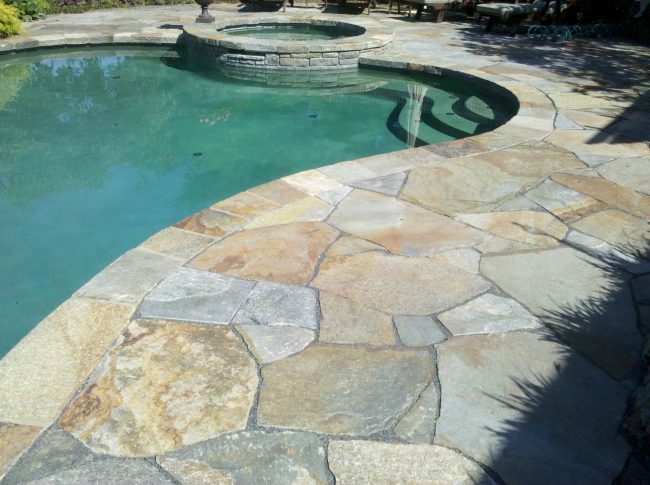 The last pool hardscape option we would like to discuss today is natural stone. Natural stone such as granite, bluestone, flagstone and more will require the greatest investment out of the options we mentioned, but they provide so much more. Providing a sophisticated, timeless and classic look to your poolscape, this material will enhance the environment and it won’t go out of style. Because natural stone is not a manmade material, it is guaranteed to withstand the elements and the test of time. Being low maintenance, durable, versatile, aesthetic, slip resistant, water and heat repellent, as well as the ability to be spot corrected in the same manner as concrete pavers, it is easy to see why more homeowners are opting to invest in this material for their home. While natural stone hardscapes enhance the value of your home and property, you will find that it also enhances your personal value and enjoyment of the space as well. When personal style calls for a material that enriches the atmosphere and a home calls for a material to match its significance, natural stone is worth discussing with a trusted landscape designer! It also never hurts to think outside the box and explore novel ideas to incorporate into a poolscape or outdoor living space! If you are looking to transform your backyard or your outdoor space begs for your personal unique stamp, reach out to MasterPLAN Outdoor Living! MasterPLAN loves challenges and is always up to the task of providing custom outdoor solutions to make each individual family happy and every distinct property stand out! 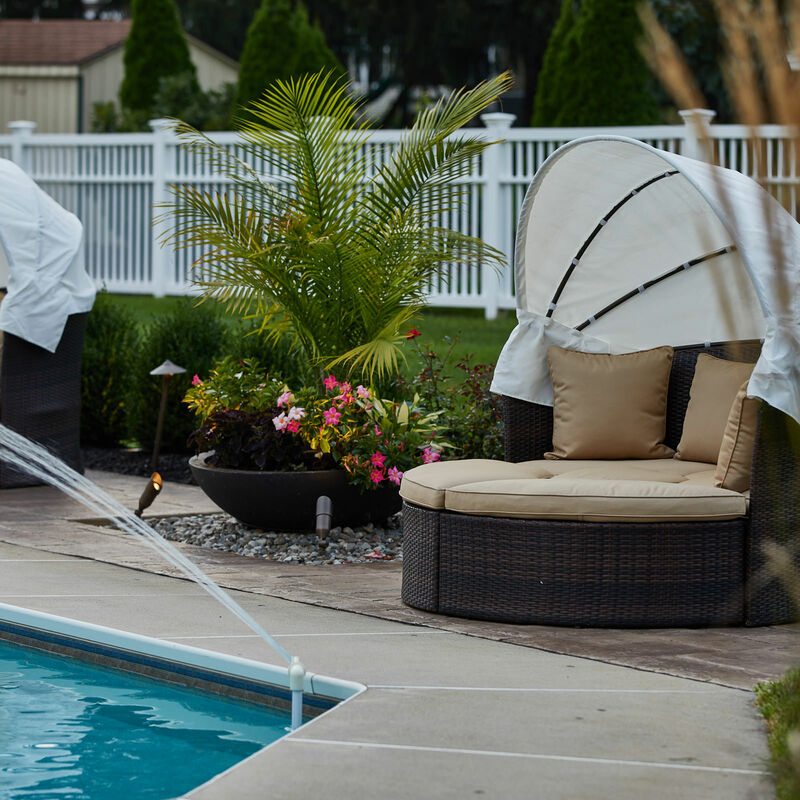 Serving the Poconos, Lehigh Valley through the Main Line of Philadelphia, MasterPLAN would love to discuss all options to transform your outdoor dreams into your reality; from concept to completion, we guarantee you will fall in love with your home all over again!